I have quite a bit going on in my life at the moment, and I'm not planning to do new nails any time soon. I do however have some fabulous products to show you that I received from my favourite nail care shop, Bliss Kiss. The items I'm showing you today is new branding Simply Peel Liquid Latex Barrier and Simply Kissed Moisturizing Lip Balm. So these are the products I received. Left is Simply Peel Liquid Latex Barrier. Product page is here and the price is $12.47. Right is Simply Kissed Moisturizing Lip Balm. Product page is here and the price is $3.49. I'll show you Simply Peel first. Some of you may remember my first Simply Peel review I did on this post. The one I'm showing you today is in a new label. Everything else except for the label; formula, volume, bottle, brush etc, is exactly the same, so I would recommend reading the post above for in-depth review about this product. The left bottle in the pic is the old model, and the right bottle is the new branding one that you can buy from the shop. At the back of the bottle, you can find directions and a list of ingredients. Note that if you have latex allergy, be sure not to use the product. 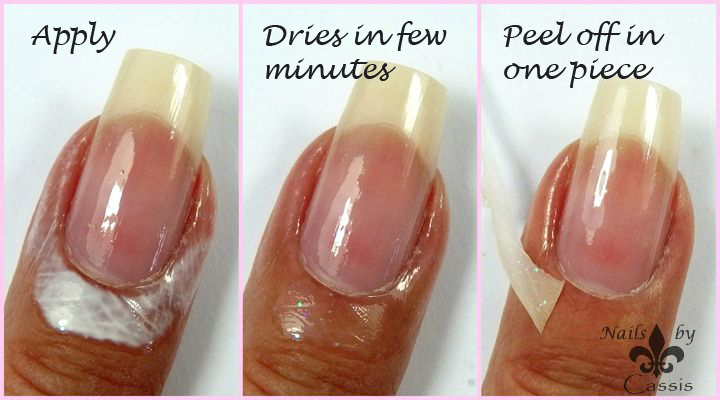 I showed 3 usages of Simply Peel in my other post, so I'll just show you a quick demo this time. 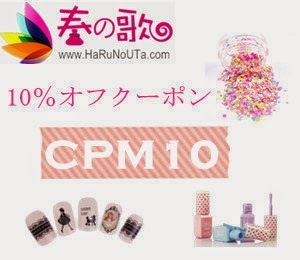 It performs exactly the same with the old one; after you apply it around your nail, it dries clear in few minutes. Then do whatever messy stuff necessary (gradient, water marble etc), and just peel it off in one nice piece. When you purchase Simply Peel, you may also receive this friendly notice. During transit, it sometimes happens that the package containing Simply Peel is left in extreme heat, causing it to dry up. If you receive the package and Simply Peel is already solid and unusable, don't fret. You just need to contact Bliss Kiss and they are happy to replace it for free. Now tell me, how many companies do you know give you a notice like this? Seriously, Bliss Kiss has the best customer service. Moving onto Simply Kissed Moisturizing Lip Balm. This is a completely new product that Bliss Kiss recently started to sell. If you read the product description, you'll get to know how it was developed and how much effort was put into creating this little product. As the description says, 'Simply Kissed™ lip balm is a unique blend of five natural ingredients with no additives, preservatives, colorants or fragrances. Many lip balms contain petroleum derivatives which actually cause dryness and require even more frequent applications.' Ana is right - my most used lip balm, Vaseline Lip Therapy, lists petrolatum as the first ingredient. So, I decided to put this product to test. A bit of a background of my lip status. My lips are the most troublesome part of my whole body - they are always dry, cracking, peeling, sometimes bleeding. I subconsciously reach for my lips and start peeling because there's always a loose skin on my lips, and my husband always goes mad because that often leads to bleeding. As I said before, I use Vaseline Lip Therapy most exclusively for 5+ years. I just like the smell of it, and its very waxy texture makes me think it's very moisturising. Is it effective? Well, I still have cracking lips even when I use this, so I would say not so much. But I still keep using it because none of the other lip balms I have tried completely give me silky smooth lips, and as I said, I like its smell so much. Back to Simply Kissed. I've used this exclusively for a week and took note of how everything went. No lip photos sorry, I wasn't game enough to take a photo of my 'before' status! Day 1: Just before I started using it, I subconsciously peeled off my lip skin again and had a massive bleeding. Tissue was covered with blood! When that was settled, I applied Simply Kissed. It had no smell and was very light in texture compared to Vaseline Lip Therapy. My lips dried in about an hour, so I applied again. I repeated that every few hours that day, ended up applying 6-8 times all up. I applied again just before bed. Day 2: My lips were dry when I woke up so I applied again. I decided to apply a little thicker than I did on Day 1. I applied every 2-3 hours. My lips started to feel smooth and less loose skin. I applied just before bed. Day 3: I woke up in the middle of the night and my lips were dry, so I applied again. In the morning my lips were moist with minor loose skin. I applied every 2-3 hours, and by evening I had no loose skin. I applied just before bed. Day 4: When I woke up in the morning, my lips were still moist and smooth. No dead skin to pick at. Because of this, I forgot to apply frequently and only applied like every 4-5 hours. Day 5 onward: I kept this 'every 4-5 hours' pace and my lips were in great condition. I sometimes get loose skin which peels off smoothly without bleeding and my lips stay smooth not bumpy. So, I was ready to do a full week's test, even two weeks if necessary, but at Day 5, my lips were already in great condition. As of this writing, it's been already two weeks since I started using it, and I have zero problem. I don't remember the last time my lips are this smooth, not bumpy, and without bleeding! The result may change for individuals, climates, and work environment, but for me this Simply Kissed worked amazingly. 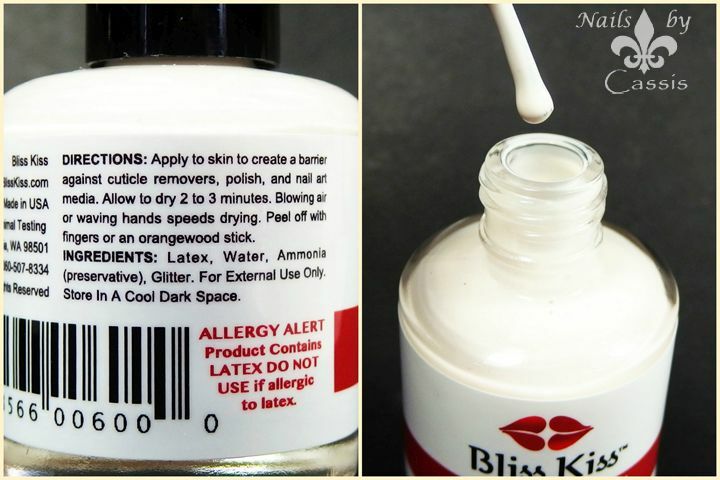 Another great well-thought product from Bliss Kiss, and I know I'll be stocking up when this one runs out. If you have trouble with your lips as I do, why not try this? By this time of the month, almost every nail artist in the world has created at least one Halloween mani for the year right? Well, I wasn't really sure if I'd be able to create one this year. I'm just not good at creating seasonal manis which have to be done at certain time of the year. After I did the review on Pueen Halloween plate, however, I feel motivated to create one just in time. Middle finger & ring finger: Base is Sinful Colors Cold Leather (middle) and JOSS Dazzling (ring). Because Sinful Colors Cold Leather is a matte polish and decal won't stick to a matte surface, I applied topcoat before proceeding. I made stamping decals out of 2 different skull images from Pueen Halloween Party 01 plate using Pueen Pure White, and coloured in with red (JOSS Dazzling), gray (A-England Wuthering Heights), and navy (Sinful Colors Cold Leather). Once decals are dry, I peeled them off stamper and placed each on these 2 nails. Finished off with HK Girl topcoat. Thumb, pointer & pinkie: Base is Rimmel Gray Matter. I stamped the splatter image on the same plate with navy (Ya Qin An Navy), red (Pueen Exotic Red) & white (Pueen White). I couldn't finish this mani in one sitting as I was super busy. Decals were pre-made (just before topcoated) on Day 1, base was painted on Day 2, and the rest of the process I finished on Day 3, duh! There are just too many things going on at the moment, that it's hard to concentrate on doing nails. Anyway, I'm glad I have one Halloween mani done this year. I've seen so many purple and orange manis this month already, so tried staying away from those colours. No a typical Halloween mani, but that's what I like about this mani. By the way, this midi ring is from Luna Pyxis. I bought 3 recently, and am keen to get more! I have 2 new plates to show you today. They are newest release from Pueen Cosmetics, and one is Halloween plate and the other is a layering plate called Double Fun. These are what I received. Product page is here and here. Price is $4.99 each. This is what the plates look like after taking the blue film off. Plate measures 12.5cm x 6.5cm. As with other rectangle plates from Pueen, they have pretty plastic backing as shown above. It's quite thick and makes the plate sturdy. Below, I'll show you each plate pic followed by paper swatch. Swatches are done with a regular polish (Sinful Colors Savage). As the images vary in size, I included measurement of some of the images for reference. First up is Halloween Party 01 plate. Great variety of Halloween images perfect for this season. Full size images are all 2.4cm x 1.7cm, so they are great for long nail gals. Smaller image are not too small, not to big, just the right size. Everything stamps wonderfully. And this is Double Fun 01 plate. As you can see, this is a 'layering plate'. If you don't know what a layering plate is, I recently reviewed one on this post with some example so you can get an idea. You can get tree+leaves, feathers, strawberry, globe, rose, flowers etc out of this little plate. It sure is a fun plate, and again everything stamps beautifully. So what do you think about these plates? I only have a few Halloween plates and layering plates, so I'm excited to have these in my collection. I haven't done any Halloween manis yet this year, and am hoping to create one soon. I feel a bit better for the last couple of days, so I decided to create a design using one of the Cici & Sisi acrylic plates that I showed you on previous post. Thumb, middle & ring finger: Base is one thin coat of Picture Polish Lakodom. I placed 3 sets of regular chevron tape from What's Up Nails, and painted Picture Polish bonkers, camo & sky on each divided section. I peeled off the tapes as I painted them. Next, I made a stamping decal out of arrow geometric image on Cici & Sisi Geometry 01 plate using Messy Mansion Carbon, coloured in with Messy Mansion Soft Gold. I peeled off the decal and placed it onto these 3 nails. Finished off with Glisten & Glow HK Girl topcoat. Pointer & pinkie: Base is Face of Australia Don't Judge Me (black). I made a stamping decal out of a different geometric image on the same plate using Messy Mansion Soft Gold, coloured in with Picture Polish shades used above, and placed it onto these nails. All 4 plates are fabulous, but I couldn't resist using this Geometry 01 plate first. As for colours, I simply used a few more of my untried Picture Polish shades (bonkers, camo & sky), and I was surprised they go so well together. I'm happy with the end result. Face of Australia Don't Judge Me! After I did my first review on their acrylic plate, Cici & Sisi released a bunch more plates for us to drool over. I received some of them in the mail for review, and would like to show the swatches and share my thoughts. So these are the plate I received. You can find all the acrylic plates under this page. Each plate measures 9.5cm x 9.5cm, and is priced at $5.99. This is the back of the plates. How pretty are these!? Makes me want to collect all the themes. Below I'll show you each plate pic followed by paper swatch. For some of the images, I included a measurement as well so you can get an idea of the size of the stamp. Swatch is done with a regular nail polish (Sinful Colors Savage) and Messy Mansion pink stamper. First up is Greek Myth 02 plate. So super gorgeous and unique. I have a soft spot for cultural plates, and this one is just perfect. All the images stamp beautifully. Next up is Geometry 01 plate. OK folks, I freaking LOVE this plate! I have a lot of geometric plates, but this one is so intricate and unique. Most of the images are 1.6cm x 2.0cm, so it's a great size. I have one issue with this plate however. The pic above is after I applied polish and scraped. Can you see the vertical lines and Cici & Sisi logo appearing on the surface? Somehow back printing of the plate shows through the surface as a dent. Does this affect stamping? Yes it does a little bit. It's not very obvious in paper swatch, but being a fussy stamper I am, I did notice it. Moving onto next plate, this is Ocean 01 plate full of sea creatures and wavy patterns. There are 2 images that are quite big, that you might want to use across multiple nails. All other images are of nice size. Everything stamps nicely. Last but not least, Flower plate. This one is typically called 'layering plate' or 'layered plate' and has a different use than other plates. You stamp one image, then stamp (layer) another with different colour on top of the previous stamp using clear stamper. I'll show you some examples below. As for the quality, I mis-stamped a few images which I repeated on the very right. Everything looks great. Above is the example of how you use this layering plate. 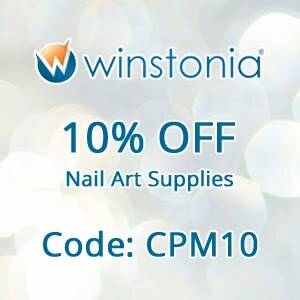 This enables you to use multiple colours without resorting to advanced stamping (decals). Lining up multiple images needs a bit of a practice, but once you get used to it, it saves time and still gives fun effect. So there you have it. Another fun plates from Cici & Sisi, and I'm excited to have these in my collection. (Updated to add: As for cleaning acrylic plates, make sure you use acetone-free remover so you don't risk melting the plates.) I'm slowing down with my nail activity due to my health problem, but I'll create some nail arts when I feel better.